These documents are provided as a reference resource for participants and volunteers supporting the RCT Catchpool Restoration Project. 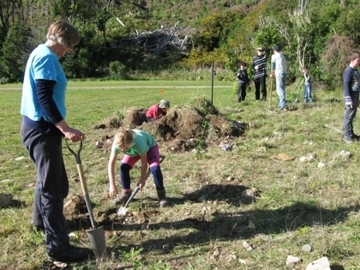 (Above) Families planting native trees during a Belmont Scouts Volunteer Day, Catchpool Valley, Remutaka Forest Park. Photos credit: PC. 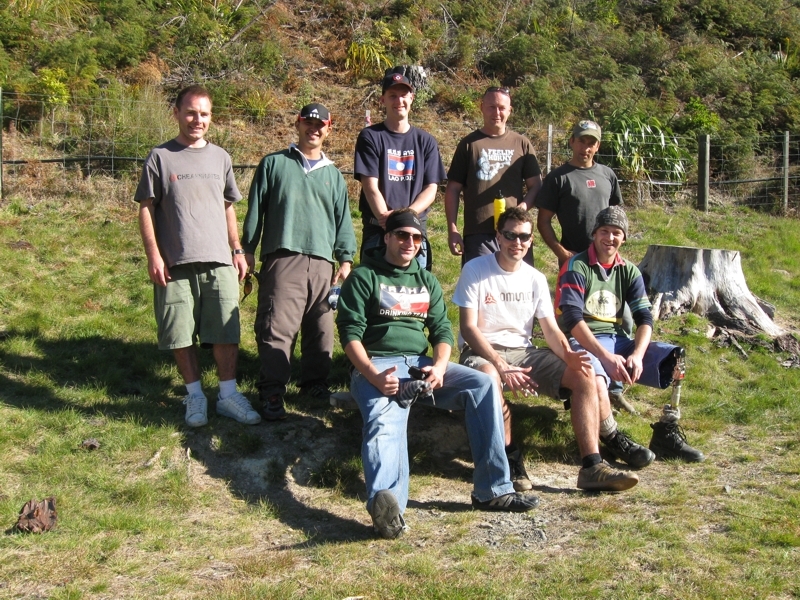 The lads from EFTPOS NZ Ltd planted more than 260 trees on their volunteer planting day in the Park during September. (Click for a larger image). 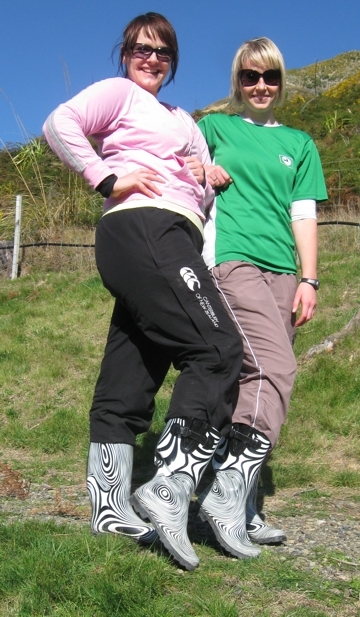 Melissa Middleton & colleague proudly show off their designer gumboots during their community volunteer day's planting efforts. Photos credit: PC. 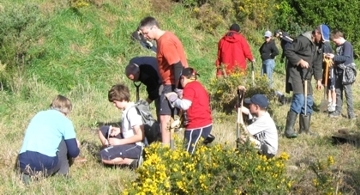 The Rimutaka Forest Park Trust committee originally endorsed the pursuit of this grant during 2008 and are keen to execute their obligations under the charter. At the June 9th 2009 committee meeting, RFPT member Peter Cooper was appointed as the project coordinator for this undertaking. A formal acceptance and thank you letter was sent by Trust Secretary, Melody McLaughlin to Alan White, Fund Manager, Biodiversity Funds, Community Conservation Fund and TFBIS Programme at the Department of Conservation on the 30th April, 2009. The camping ground and picnic areas in the Catchpool Valley are frequently used during the summer months and thousands more people enter and exit the Park via this corridor throughout the year on their way to and from the many excellent tracks and huts within the Park. Unfortunately, the hillsides above the Catchpool Stream on the South Eastern flank entrance to the valley are looking bare and scarred following the recent clear-felling of the pine forest that was planted there in the 1960s – and further devastated by the “weather bomb” and consequent floods/ erosion that struck the area in March, 2005. Many locals claim that it is an eyesore, with the entrance to the Park not nearly as attractive as it used to be. Our opportunity here is to create a better first impression for new visitors to the Park; and a steadily improving vista for regular visitors and critical local residents. More importantly, we will be creating a better habitat for native flora and fauna - and there is the additional tantalising opportunity to re-establish species that once were present in the Park but now are missing. Restoration of a retired logging area in ‘nodes’ - starting in gullies where small pockets of remaining native vegetation can be enhanced and expanded to encourage birds for natural seed dispersal. Extend the streamside/wetland planting to reduce flooding and erosion and ensure clean water for the native fish species found in the tributaries such as kokopu, koaro and koura. Establish ridge plants alongside proposed tracks to further encourage wildlife and provide a range of vegetation necessary for ecological diversity. 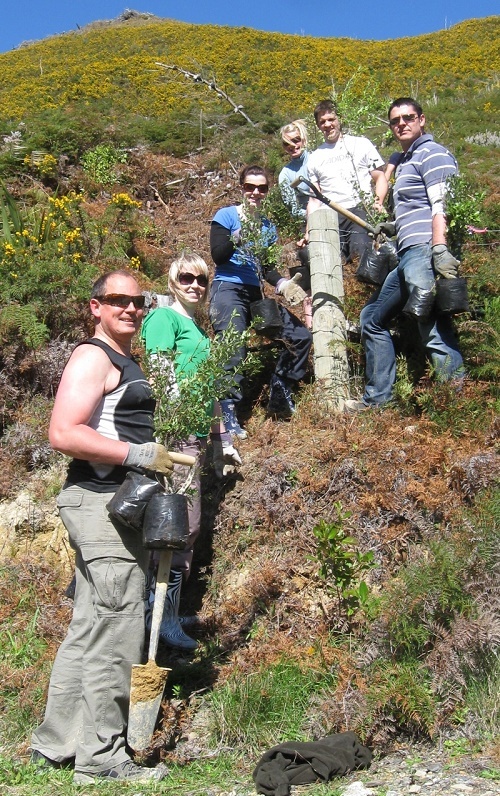 Provide an increased opportunity for different sectors of the community to be involved and engaged in conservation in the Park. Restore vegetative communities characteristic of the Remutaka range valley ecosystems. Provide and extend high quality habitat for the indigenous fauna of the Remutaka ranges. Enhance the aesthetic value of the valley, particularly the south eastern valley slopes. Provide a means for community engagement and education in the valley. The Trust sees this as a natural extension of the work currently being undertaken in relation to fauna restoration, understanding the connective nature of the flora and fauna to establish a natural habitat and food source for native birds and create an environment that links to our long-term goals. Short term: Meet the increasing desire from the community groups/education and businesses (corporate organisations) to actively participate in conservation efforts in the park - one of the best ways to achieve this is through restoration projects building up the resource pool of volunteers to support the long term goal. Actively encourage more people into the park to create a positive environment and a sense of ownership to the place through hands-on involvement. Long term: Establish an ongoing restoration network of groups and individuals who will take responsibility and maintain the ongoing plantings, accelerating the natural regeneration of native flora within the park by creating the ‘nodes’ of planting to act as seed sources this will in turn support the Trust's objectives to re introduce other species, both flora and fauna, back into the park. Reintroduction of plants species that once were present in park.